Today my guest is Mitch Steele. Mitch is the Brewmaster and COO at New Realm Brewing in Atlanta and former Brewmaster at Stone. Mitch also wrote the book on IPAs called IPAs: Brewing Techniques and the Evolution of India Pale Ale (Amazon affiliate link). Mitch holds a degree in Fermentation Sciences from the University of California at Davis. We discuss Mitch’s new brewery “New Realm” which just launched in Atlanta. 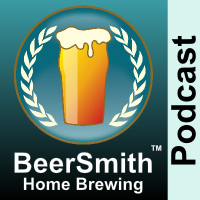 We start with a discussion of whole hops and how best to use them in brewing beer. Next we move on to pellet hops and discuss their advantages and disadvantages as well as how to best use them. Mitch shares his thoughts on working with wet hops (fresh hops off the bine) that have not been dried or processed and why its important to use them within about 24 hours. We discuss “cryohops” and luplin powders including how they are made and why they are best used in the whirlpool or dry hopping. Mitch talks about CO2 extracts, and how they are made and best used in the boil. We discuss isomerized extracts which can be added even to a finished beer to increase bitterness. Mitch explains traditional hop oils and how these can be used in brewing. We talk about aromatic hop oils and how many are now being isolated for use in brewing – i.e. you can get a single hop compound like myrcene. Mitch provides his closing thoughts on the proliferation of hop products and where they are going next. Thanks to Mitch Steele for appearing on the show and also to you for listening!